Ruth . 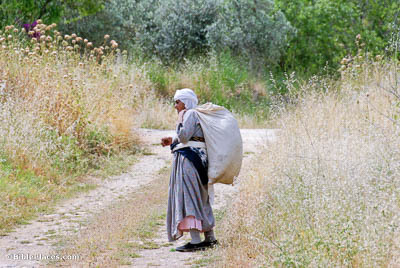 . . said to Naomi, “Let me now go to the field and glean among the ears of grain” (Ruth 2:2). 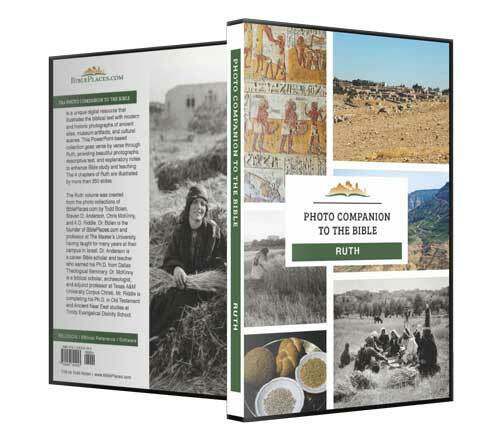 Ruth and Naomi were the beneficiaries of a rule given to Israel by God. 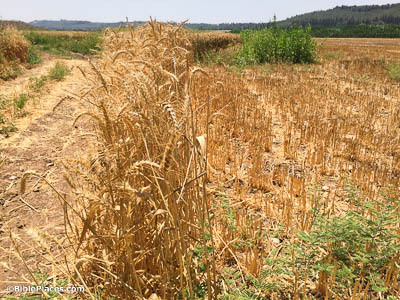 As Leviticus 19:9-10 records, farmers were commanded not to harvest the very edges of their fields, so that the leftover grain could be enjoyed by those who had no other source of food. The practice survives today, as shown in this picture. The fact that Boaz was faithful to this command is just one example of his noble character. She happened to come to the part of the field that belonged to Boaz . . . of the clan of Elimelech (Ruth 2:3). In parts of the Near East, some cultural habits have remained untouched through the millennia. It has long been customary to mark the boundaries between fields by taking stones from the ground and shaping them into rough lines. These low walls, which may very well have been part of Ruth and Boaz’s world, were still a common sight when this picture was taken in 1968. Boaz came from Bethlehem and said to the reapers, “The Lord be with you” (Ruth 2:4). 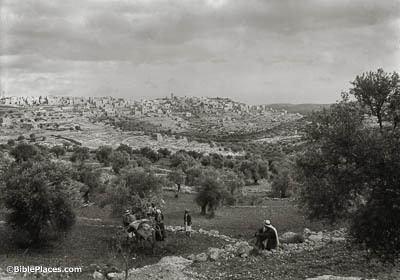 In the 1930s, when this picture was taken, Bethlehem had already grown much larger than the village Boaz lived in. 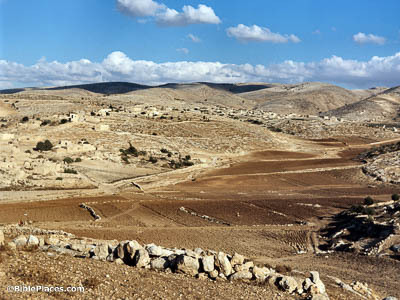 But this image is very valuable in demonstrating the distance between Bethlehem’s city proper and its surrounding fields, which can be seen in the foreground. In order to visit his workers, Boaz had to descend from the village and walk out a fair distance. Ruth would later travel this same route carrying an ephah of barley. So she came, and has continued from the morning until now, except for a short rest in the shelter (Ruth 2:7). On the topic of longlived practices, this verse may be referencing another ancient habit of farmers that survives even today. It was common for basic shelters to be built in fields, which would provide shade for the workers while they took breaks from reaping. This way, they wouldn’t need to walk all the way back to the village to find reprieve from the elements. 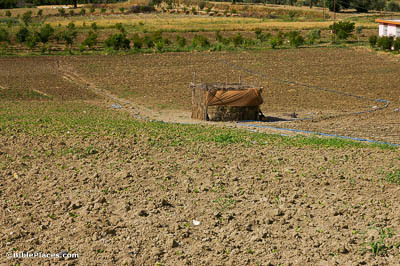 These practical structures can still be found today, such as this one in a field in southern Turkey. So she came, and has continued from the morning until now, except for a short rest in the shelter (Ruth 2:7). “Shelter” isn’t the only possible translation of the word in this verse. The author of Ruth could also be referring to a house, and given Boaz’s wealth, it’s possible that he had a house near his fields. This photo was taken at the Eretz Israel Museum in Tel Aviv, where they have reconstructed a house from roughly the time of Ruth. 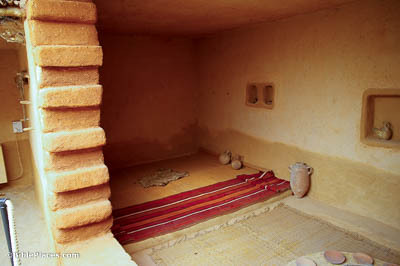 The style of this room may give us a good idea of what a house belonging to Boaz would have looked like. She beat out what she had gleaned, and it was about an ephah of barley (Ruth 2:17). It is not exactly clear how much grain the author meant by an “ephah.” Sources differ on the size of this measure, since it changed dramatically after the exile. However, it’s safe to say that an ephah was somewhere between 10 and 40 liters, which is a handsome day’s haul by any count. If Ruth gathered at this same rate until the end of the harvest, she and Naomi would have had food enough for most of the coming year.